There you can manage your Office 365 Calendar Add-In data sources. In order to delete a data source, use corresponding “X” button opposite the required source. Use “edit” button to modify required data source or click on data source name to edit it. You can choose the color of data source events displayed in calendar by clicking on data source edit button or right in this table by clicking on the data source color. To add a new data source to the calendar, use “Create New” button. Now type the name of new data source. 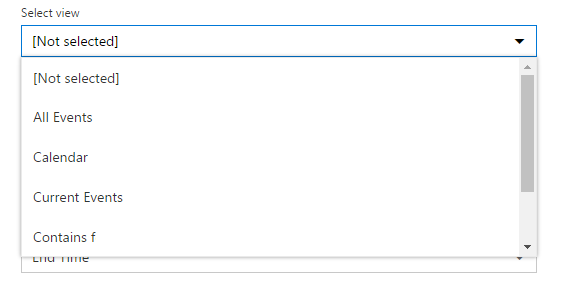 Select the required site and select required list with data in the dropdown. 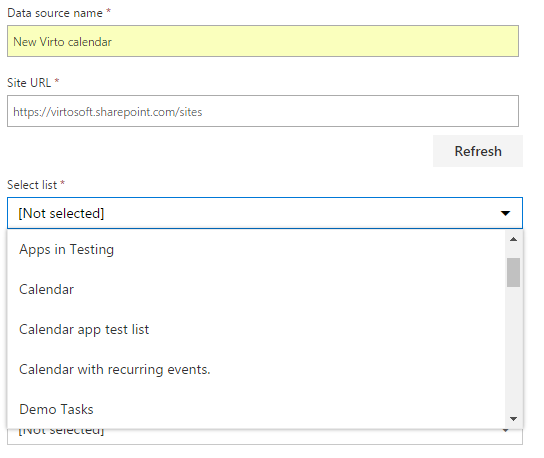 Note: you can add lists from any amount of sites from SharePoint site collection. 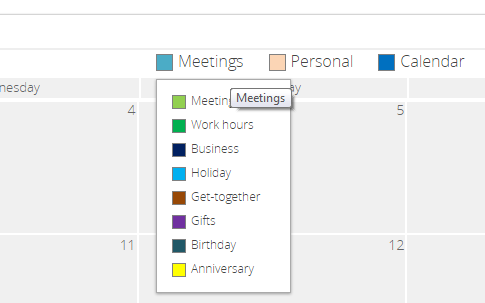 When you chose a calendar list, the Title fields and Time fields are filled automatically from corresponding columns. Otherwise you can select field values manually. 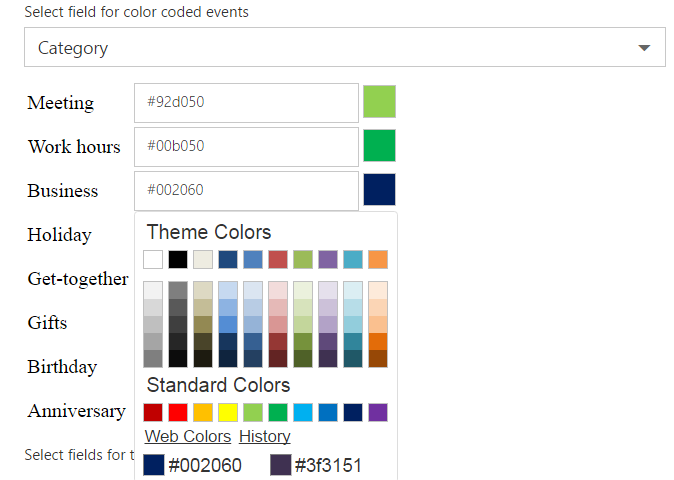 Select the color which will be used to color-code events of new data source. 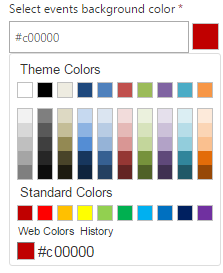 Click “Web colors” to select a custom data source color. 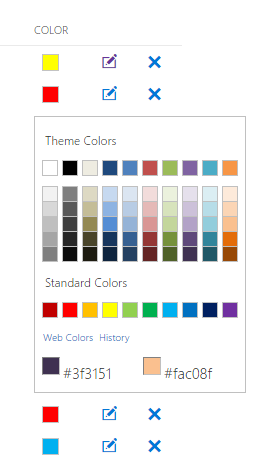 Click “History” to display previously chosen colors. You can adjust colors for color coded events. This feature is optional, and you can use it to display the event categories in your calendar (meetings, work hours, holidays, etc). 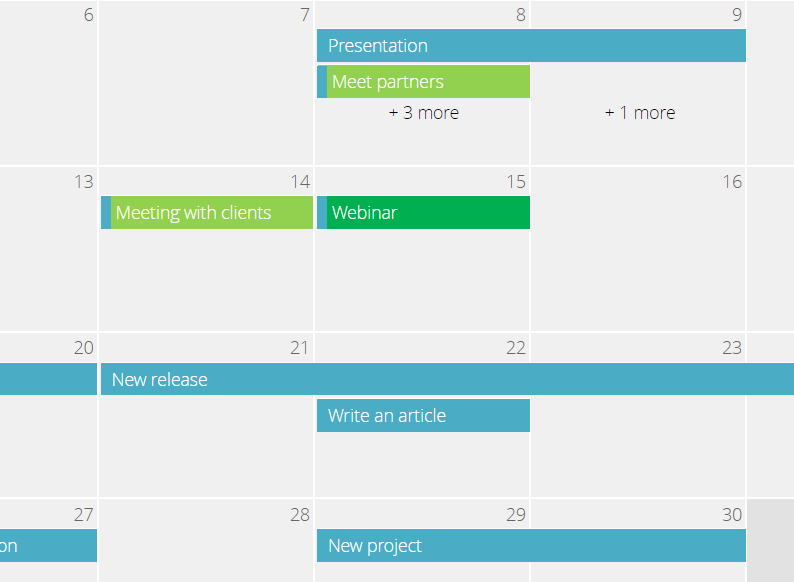 The event category has its own color, while the calendar data source color will be displayed as color marker on the left side if the event (see the example below). 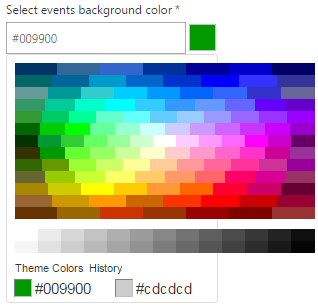 Select a choice field, which will be used for color coded events. Then adjust colors for each event type. Now the color coded event will be displayed with a chosen color. 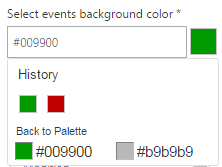 The color marker on the left side of color coded events is corresponded to the data source color. You can see the color coded events legend by hovering the mouse tip over data source name. Next step is the tooltip adjustment (the pop-up that appears when you click the event in the calendar). You can display more than one of event fields in tooltips. To select multiple values press “Ctrl” and select required fields. You can also adjust fields for event’s create\edit form as in previous example. Arrows buttons allow you to move a field up and down. This way, you can assign the fields order to form. Do not forget to check the box "Apply the exact fields order to form" to save the selected order. Now click “Save” to create the data source. It will be displayed in the list of data sources.